If you want a copy of the handouts from the Grow Good Food Workshop this morning, they are available here for downloading and printing. Afternoon Session 1 – 4-H Hall, 1-4 p.m. Afternoon Session 2 – Sunflower Room, 1-3 p.m. In the past our Spring Gardening Series has been held on Tuesday evenings during January and February. Starting in January 2011 those classes will be combined into a one day workshop on January 29 from 8:30 a.m. to 3 p.m. Two seminars will be running at the same time, for a total of 10 seminars. Cost is $5 per person, call Angie at 660-0100 to register. Look forward to a wealth of Gardening information all packed into one day. Do you love everything tomato? Have you struggled to grow great tomatoes? The 21st Annual Tomato Day is for you! The event will be held at the Sedgwick County Extension Education Center at 21st and Ridge in Wichita on Saturday, July 24th from 7:00 a.m. – 12:00 p.m. 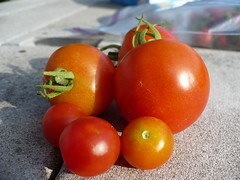 This event features information on selecting, planting, maintaining, cooking with tomatoes. Admission is free. Gardeners, bring your home grown tomatoes and enter them in a contest for Ugliest, Largest, Best Heirloom Specimen, Best Plate of 3 Standard tomatoes and more! The cooks in the family can enter Fresh or Preserved Salsa. Preserved salsa must meet USDA approved processing methods; this information is available at the Extension Office. The Tomato Photography contest returns with categories of Mr. Tomato Head, The Artistic Tomato and Best Unique Tomato Growing Method. Prizes will be given in all contests and categories. For more information on contests, please visit http://tinyurl.com/TomatoDay2010. Seminars in the Demonstration Garden and Sunflower Room include a wide variety of gardening and cooking subjects. The 15th Annual Herb Day will be held at the Sedgwick County Extension Education Center at 21st and Ridge in Wichita on Saturday May 1st from 7:00 a.m. – 2:00 p.m. Admission is free. Plant vendors from around the region will have herbs and other plants for sale.